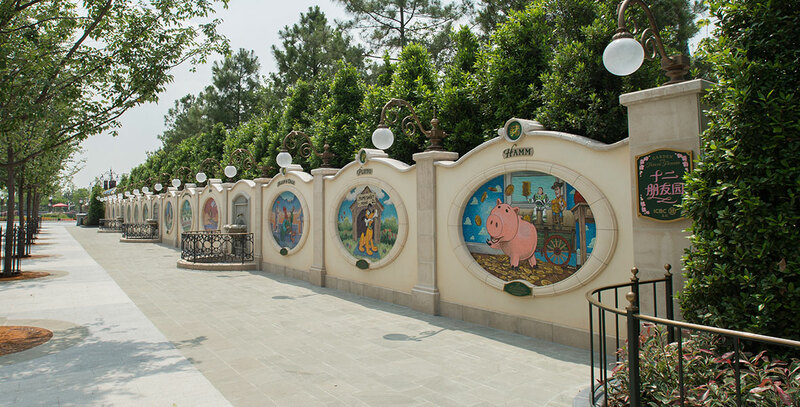 Garden of the Twelve Friends Gardens of Imagination attraction at Shanghai Disneyland; opened June 16, 2016. Guests experience a colorful garden with vignettes of Disney and Disney•Pixar characters chosen to represent the 12 signs of the Chinese zodiac: Remy (rat), Babe, the Blue Ox (ox), Tigger (tiger), Thumper (rabbit), Mushu (dragon), Kaa (snake), Maximus (horse), “Jolly Holiday” lambs (sheep), Abu (monkey), Allan-a-Dale (rooster), Pluto (dog), and Hamm (pig). Chinese artisans created the mosaic wall.